Have you ever worked in a shop before? I did. And I found it a rather eclectic pursuit myself. The money was bad. The customers were dodgy. My employer was looming And the environment was confining. Or, in other words, it was full of bull-sh*t! Oh! Do you know who else is full of bull-sh*t? Director / Actor, Kevin Smith, along with Jeff Anderson, Jason Mews, and Brian O'Halloran. But only for 92 minutes in 1994. Being a convenience store clerk in New Jersey, can be a right drag at times. Take bearded clerk, Dante Hicks (Brian O'Halloran), for example. He is unhappy with his station in life. He is unable to guide himself in a more positive direction. And obediently, he just saunters through his job by satisfying his customer’s wishes, and complying - as best he can - to stay as steady and as reliable as possible (even when he isn't supposed to be there). Now the ying to Dante’s yang is his slacker work-college, Randal Graves (Jeff Anderson), who ‘looks after’ the video store just adjacent to Dante’s place of work. Well, when I say 'looks after', what I mean by this, is that unlike Dante, Randal is a very lazy clerk, and just schleps and slides his way through the day, amusing himself by working without working. However, on one day in particular, Dante’s love-life seems to take over from his daily work chores. He’s in love with a girl called Caitlin you see - his un-virtuous ex, who is marrying an Asian design major. Whereas his current beau is a very nice girl called Veronica - who try’s her best to curb Dante’s life in a more stable direction. Granted, 'other things' also seem to distract Dante during his day as well. Such as: a Hockey game that he plays on the roof of the convenience store - crazy customers whom traffic the store - and attending a past lovers wake. Nevertheless, nearing the end of the day, Dante's love life comes back to haunt him with a vengence. Caitlin - his un-virtuous ex - enters the store, and confesses to him that she does not want to get married. Worst still, Randal lets slip to Dante's current beau - Veronica - his true feelings towards Caitlin . Ouch! That is most probably why what next transpires calls for some help from Jay and Silent Bob (Kevin Smith and Jason Mews). As one girl goes catatonic - the other one goes chronic - friends have a fight - and at the end of the day, you just have to call it a night. Now in very real term, 'Clerks' is Kevin Smiths maiden voyage as writer / director / actor, giving him the platform to showcase his rather eclectic and suburban slice of life to all in sundry. OK, I have to admit, as a film goes, it is somewhat rough and ready around the edges - starring no-one famous or having a straight forward plot-line. Saying all that though, this film does have a certain amount of congenial charm and splendor to it, and reminds me of the old saying 'Capturing the exuberance of youth can never be in detriment'. Maybe this is because this picture is shot in Black and White? Or maybe it is because of the rather grungy feel it conveys? Or better yet, it’s most probably due to Kevin’s brash dialogue? Well, on the one hand, his prose is rather crude and sexually driven. Whilst, on the other hand, the realistic tone to his dialogue, does drive the film along in a rather nice way - almost with a sketch-like quality to it. And do you know what? That is the best thing about this movie you know - the sketches. You see, in each scene of the film, there is a customer with some unusual behavior or strange tick on display, be it physical, emotional, or textural, and allows for the clerks to either interact with, or comment on, as they see fit. Oh! Whilst I am on the subject of behavior', I have to say that I felt that both Brian and Jeff really gave the main characters enough life to drive the movie along quite nicely, and do deserve credit, considering that they were both amateurs at the time this film was made. And as for the main story-line itself? Well? It does seem to meander back and forth through the scenes. But it comes shining through at the end – making the whole Dante, Veronica, and Caitlin, love triangle, the main focus and drive of the movie. OK - that - plus Jason Mews and Kevin Smiths appearance as the slackers from hell of course, Jay and Silent Bob. Smooch to the hooch! Just Like these filmic-facts: (1) The whole film was recorded and edited in the same store that first time writer / director / actor, Kevin Smith, was working in at the time. Outside business hours of course. (2) Kevin Smith raised this money for this movie, $31,000, by maxing out credit cards, selling a lot of his own comic books, and borrowing money from family and friends. (3) One of Kevin's pals, Walter Flanagan, plays about four different parts in this film. (4) The first draft of the script was 168 pages long - more than most. (5) The overall premise is loosely based on "The Divine Comedy" by Dante Alighieri. (6) Originally Kevin cast himself as Randal, but decided to drop out because he thought that he would be stretching himself too thin. (7) Jeff Anderson auditioned for the role of Jay first. (8) The "Milk Maid" is Kevin's mother, Grace. (8) Jason Mews was so camera shy during the shoot, that he was pissed nigh on through out it. That is why 'Silent Bob' had to deliver his line at the end of the flick - it was originally 'Jay's'. (9) After this movie was made, Kevin and his producer, Scott Mosier, were going to make a film devised by Scott next. (10) Jeff and the actress who played Caitlin, Lisa Spoonhauer, went out together after this film was completed. And (11) Originally Dante was going to be killed at the end of this film. A scene was shot, but omitted from the final release. 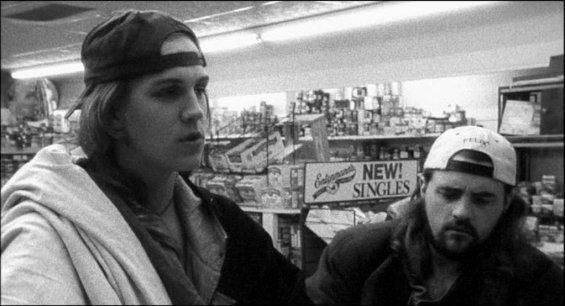 All in all, 'Clerks' is a really great movie, which shows what one man can do when he puts his mind to it. Moreover, its funny, it has a sketch-like quality to it, and is one of those films you can not help coming back to again and again and again. Agreed guys?